Realistic HIPAA security budgets vs. wishful thinking. HIPAA compliance is rarely allocated the resources it requires. And this trend extends beyond just small organizations with limited security budgets. Lack of budget is a plague that affects risk and compliance officers at health organizations of all sizes. This post will give you the information you need to more accurately plan your HIPAA budget. What does the HHS think HIPAA compliance costs? 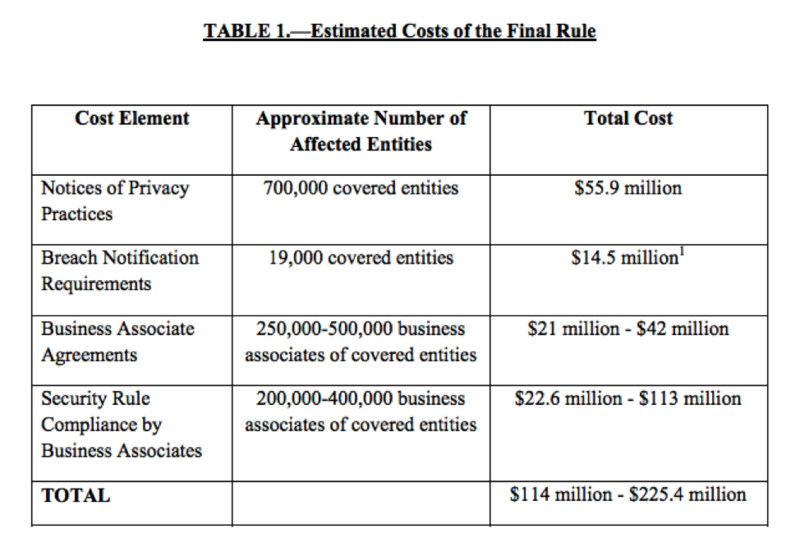 The HHS gave an interesting estimation (see Table 1) of how much HIPAA compliance might cost, shortly after they released the HIPAA Final Rule in 2013. This estimate is likely inaccurate, especially when considering the complexities of the Security Rule. When the Security Rule was added back in 2003, it included 75 new requirements and 254 points for organizations to validate to, most of which are quite technical. The following is an example of a "validation point:"
Where are P&P stored? How is it disseminated to staff? How do we document staff have read, understand and agree to abide by the policy? In this one example you can see that this single requirement (1 of 75) has three core validation points (3 of 254) with several more minor validation points. Looking at the math, and the HHS’ estimated $113 allotted to the security rule, that means only $4 is allowed per requirement. It would be a stretch for healthcare entities to accurately validate each new security point for only $4 worth of labor, technology, and implementation. That’s not even taking into account that you will likely need to add (or, at the very least, upgrade) hardware and applications. The cost of HIPAA compliance depends on your organization. Here are a few variables that will factor into the cost of your overall compliance. Your organization type: Are you a hospital, business associate, HIE, healthcare clearinghouse, or another type of healthcare provider? Each will have varying amounts of protected health information (PHI) and risk levels. Your organization size: Typically, the larger the organization, the more vulnerabilities it has. More workforce members, more programs, more processes, more computers, more PHI, and more departments add up to more HIPAA cost. Your organization’s culture: If data security is one of upper management’s top priorities, you have probably already invested in a cybersecurity program. If management has been hesitant to dedicate budget to security, compliance with HIPAA will cost more because you will have more distance to make up. Your organization’s environment: The type of medical devices, the brand of computers, the kind of firewalls, the model of backend servers, etc. can all affect HIPAA compliance cost. If cybersecurity was considered when purchasing, implementing and maintaining these devices, the costs to comply with HIPAA at this point will be lower. If security was not considered, costs to get in line with HIPAA will be greater. Your organization’s dedicated HIPAA workforce: Without a dedicated HIPAA team, you might not know how far you are from closing the HIPAA gap. Even with a dedicated HIPAA team, organizations usually require outside assistance or consulting to help them meet HIPAA requirements. Costs related to a HIPAA program can seem daunting, but they are small in comparison with not protecting PHI. Here are a few data breach costs, fines, and penalties you may not have considered. When you look at the high costs paid by organizations found in violation of HIPAA, it’s obvious the consequences are meant to penalize those who don’t adequately protect patient information. So, how much does HIPAA compliance cost? If you are a large provider, you’ll probably benefit most from an onsite HIPAA compliance audit. Security experts examine your organization for security risks, provide guidance as you remediate any problems, and consult on the implementation of any outstanding HIPAA requirements. Your onsite auditor should work with you to complete both your HIPAA risk analysis and risk management plan. Learn the pros and cons of a HIPAA audit here. If you don’t have the budget for an onsite audit, you’ll need to find a HIPAA expert to help you get through the risk analysis and risk management plan process. Look for an expert who offers technical support when you have questions. Experts will likely recommend you receive external vulnerability scans to find weaknesses in your systems, and hire penetration testers (ethical hackers) to test your system. If you haven’t already, you’ll likely need to purchase HIPAA policy templates and start your employee training.